Sometimes God asks really big things of us…things that seem well beyond our capabilities, that we know will bring challenges, that most people would call crazy. Sometimes He asks so clearly it doesn’t even seem like a question. But the thing about being asked of something by a loving, faithful God, is that we know he will work things together for good, that HE knows. The big question God is asking of us started when we were in Ethiopia. There was an older girl (we will refer to her as “Y” since we can’t say her full name) at the transition home that God laid on our hearts. We didn’t get to know her as well as some of the other kids because she spent most of the day at school. But what we did know, was that she was a dear friend of Lielti’s and that she wasn’t matched with a family. We knew that in the span of a week, she would say goodbye to all three of her roommates, her close friends, and watch as they joined their forever families. It broke our hearts. Weeks after being home we couldn’t stop thinking about this girl. We started our adoption journey knowing we wanted to adopt two children and Lielti really wanted a sister. So we sent an email to our agency asking about her story. Our hearts broke for her once again when we heard that she was essentially stuck in the system. They had been working for over a year to get a clearance from the Ethiopian government for her to be adopted. They didn’t hold out much hope that it would happen any time soon, if at all. So we put away the idea that she might join our family. But we continued to pray for Y to get a family. 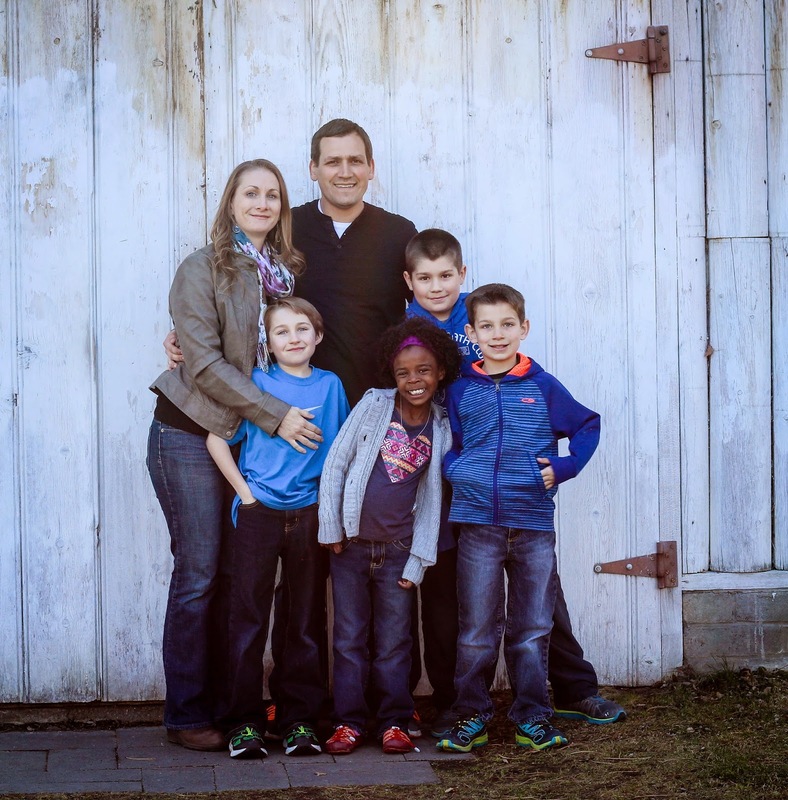 We settled into the hard work of becoming a family of six. There were days that made us sure we couldn’t handle another adoption and days that made us think another adoption would be the best thing for our family. But we didn’t make any official decisions. We had some time since our agency recommends waiting at least 6 months after being home before starting the process again. Well right about at the six month mark we got some unexpected news. Y had been cleared for adoption! This was great news, but definitely did not mean that she could join our family. We were not in the program since we had not decided for sure to adopt again. But this seemed like God swinging the door wide open. So we sent an email to our agency again expressing our desire to have Y in our family. We spent the next few days trying to keep our excitement balanced with reality, we didn’t succeed. It was so hard not to let our minds race with the excitement of having another girl in our family. Monday morning came with hard news, it seems the door that swung wide was being closed. Due to circumstances we aren’t sure we can share on our blog, it would not be possible for us to move forward. I was stunned. I didn’t realize until that moment that what I had felt over the last few days wasn’t just excitement. It was assurance. I told Brad, “I felt 100% sure that she was supposed to be in our family.” The door had clearly closed, but it did not feel right. I could not figure out why God would open this door just to close it again. I spent two days on the verge of tears. And then God did what he does. He made a way, he moved mountains and he showed us more clearly than anything we have ever seen that there was a way. Through a series of events, we were granted approval to move forward with the adoption. It was not official yet, but we could move forward. At this point moving forward meant paperwork. Most people will talk about how daunting the “paper chase” is…gathering documents, setting appointments, getting things certified and notarized. It’s a complicated process that usually takes about 3-6 months. Well, I am married to a paperwork superstar. Brad compiled our complete dossier in just over a month! Last week it became official. We have been accepted back into the program, our paperwork is in order and we are officially Y’s family! As soon as it became official, they were able to tell Y that she has a family. I can’t even imagine. This sweet girl who has seen so many of her friends have this moment. She has shared their excitement at having a family and then eventually had to say good-bye to every one of those friends. It is finally her turn. It’s her turn to be the kid sharing pictures and knowing she will have a family again…forever. And we, way over here in the corner of the United States, 8,000 miles away, have been blown away by our God moving mountains to allow us to be that family. The next morning we drove home. We were welcomed by a sweet banner that my mom and sister and nieces had made. Lielti loved it! She explored the house and her new room and loved it. Shortly after we arrived home Lielti got to meet Grandma and Grandpa Krueger, Aunt Amy, Ella, Maddie and Maisy. She made fast friends with her cousins, playing dolls and jumping on the trampoline. When they came over again yesterday after school she ran up and greeted them with a big hug. Lielti has been so full of joy at every turn. She is a go-getter if there ever was one. Her first day home she said, “Mom, me tomorrow school”! We have been shocked how easy all of this has been. She seems happy to meet new people, she loves her brothers, she goes to sleep like a champ, wakes up happy and even responds well when we have to tell her no…as in “no, I don’t think we are going to wear a purple striped shirt with pink floral leggings and red shoes”. The one thing she is resistant to, and where have seen some anxiety in her, is with food. She pretty much only wants to eat traditional Ethiopian dishes, bananas, granola bars and toast. So that’s pretty much all she’s been eating! I am sure we are in a “honeymoon” phase and I know that there are complexities buried deep even though there is a smile on her face. So we are storing up the happiness and smiles and trying to be mindful and prepared for a change that will inevitably come. Several people have asked about how communication is going. It has been surprisingly easy. I have yet to have a moment of frustration with not being able to get my point across. That said, most of what we communicate at this point is very basic. We can’t discuss things on a deeper level yet, but that will come with time. Lielti understands most of what we say, and while she can’t speak much yet, she is able to gesture and throw in enough words to get her point across. I have been trying to learn some Amharic words as well and she is good at figuring out what I am trying to say. We are going to work hard at helping her retain her Amharic. She has had a chance to Facetime with some friends from Ethiopia and absolutely loves it and it's fun for us to hear her jabber away in Amharic! As I sat with Leilti this morning, sipping coffee and eating toast I had an overwhelming sense of joy that she is finally home! I think even in the mundane moments, the excitement of having her here breaks through. Today we ventured out with another family here. Their daughter is Leilti's best friend and we enjoyed their company and watching our girls play together. We started the day by walking to a nearby salon to get Lielti's hair fixed. Our friends have been here for over a month, so they knew right where to go! $5 and 35 minutes later Lielti had a great braided hair-do. After getting her hair done we all went to lunch and the girls entertained us by putting their napkins on their heads, laughing, quoting lines from Home Alone, laughing some more and singing. We did a little bit of shopping and got ice cream before heading back to the guesthouse where the girls watched Home Alone and ate Kolo (sort of trail mix), a favorite snack of theirs. We spent the evening walking around town with a couple of families and found a great little outdoor restaurant to have dinner. We really enjoy getting to spend time with the other adoptive families here. Tomorrow we plan to head to the Transition home. There are two kids from the transition home that Lielti has spent most of her life with. As it turns out, all three of the kids' families will be here tomorrow. We plan to get a big family photo! While we are there the staff will do a little going away party for Lielti with a coffee ceremony. It will be an emotional day full of difficult goodbyes. I am tearing up just thinking of what her poor heart will be feeling tomorrow. After our goodbyes we will come back to the guesthouse and pack up to head home. We are hoping that the excitement of seeing her brothers again will help Lielti deal with her sadness in saying goodbye to her friends, her care givers and her country. If you think about it, please pray for her as she makes this huge transition and pray for wisdom for us to know how to guide her through. We walked down narrow passage ways in the Harar markets where they had many Ethiopian spices in bags like this..
Because our flight back to Addis wasn't until 2:00, we had a leisurely morning at the hotel in Dire Dawa. We had a late breakfast and then walked around town. It was very warm there so after a long walk, we took a little taxi back to the hotel. It was nice to have the breeze blowing over you. On the way back to the airport in Dire Dawa, we got out and walked around a park that housed an upside-down house. 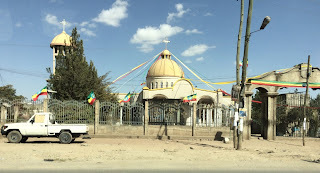 Apparently there is a festival that bounces around from city to city in Ethiopia each year and when it was Dire Dawa's turn, they constructed this house to show off their architectural abilities. There were a few ladies eating lunch underneath the steps going into the house. They offered us white folk to share some of their lunch. We were about to until our guide told us it would probably make us sick. At the airport Lielti showed off her personality and independent nature. She certainly likes to be goofy when in the right mood and enjoys walking far ahead of everyone else - even when she doesn't know where she is going, or walking right past security guards armed with automatic weapons. Once again she loved the airplane flight and even when the heavy turbulence bounced the medium-sized airplane around, she grinned really big and laughed about it. It may take her a while to open up when she gets home, but Lielti has a very fun, silly, strong-willed personality. She seems to have very little fear and a huge grin! Can't wait to get home for her to meet everyone. Today was filled with so many amazing sights, smells, sounds and feelings and yet was one of our most relaxing days in Ethiopia so far. We started the day early, meeting our guide, Yonas at 5:45 for an early flight to Harar. We had no idea what to expect from Lielti on the plane, but as soon as we woke her up and told her it was time to fly to Harar, she was excited. She even liked going through security and was especially tickled watching the luggage onto the conveyor belt at check in. We boarded the plane and she sat right down and buckled her seat belt and then immediately said, "Mom, game please". So she sat excitedly alternating between playing temple run and looking out the window. Even at take off and landing she never had a moment of nervousness. She did great! When we landed she looked and me and said "down". It was fun to see her so excited to try new things, but the best part of the morning was realizing that she was opening up to us and we were getting to see her personality a bit more. She was more confident in trying English. We landed in a city called Dire Dawa, where we checked into a very nice hotel. After we settled in, we started our one hour drive to Harare. It was so fun to see a more rural picture of Africa. People were excited to see us and would often shout "Forengo!" which is a friendly way of saying "Hi Foreigner". The kids were especially excited to wave to us and we were greeted with many excited smiles. 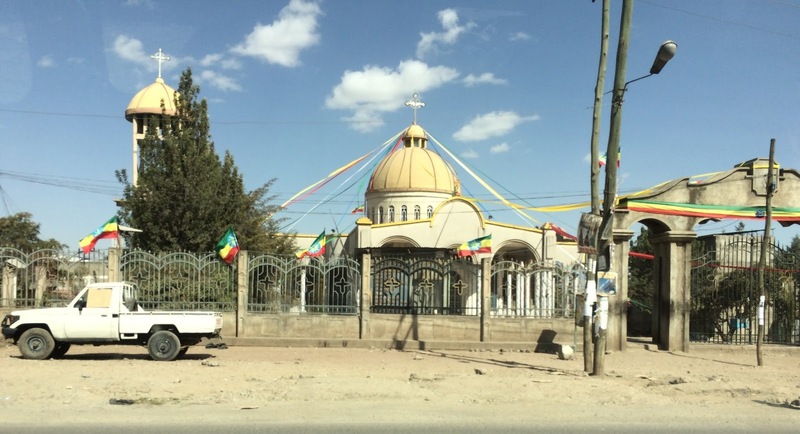 On the way to Harar, we drove through the very small town of Hamaressa where Lielti was born. She didn't remember it, but we took a lot of photos. When we arrived in Harar, we went to Tsion orphanage where Lielti spent a few months before joining the America World transition home. Lielti walked in and was eager to give hugs to the director and staff and her former guardian. While we were there we had a meeting with the woman who was her care giver before coming to Tsion. She was a wonderful lady who shared with us what she knew of Lielti's past, her temperament, and how they spent their time together. It was nice to feel like we finally had some sort of glimpse into her life before we met her. After our meeting, the staff prepared a coffee ceremony for us. It was a sunny day and we sat on a small patio drinking the best cup of coffee we have ever had (Brad even had two cups and said he truly liked it) with two of the ladies who took care of Lielti before us. It was emotional, but also felt so nice. After that we went to lunch and Lielti's guardian joined us. I shared pictures of Lielti with her on our phone and got to see her look sweetly at some and laugh enthusiastically at others. After lunch, we said our good byes and thanked her once again and then we went separate ways. We spent the afternoon driving through the old city of Harar, known as the walled city. The wall was originally constructed over 500 years ago and we drove around the whole things stopping at each of the five gates. We got out and walked through crowded markets full of fresh spices, grains, coffee, baskets and fabric. It was crowded and energetic and so friendly. A couple of people asked about us and Lielti, and when our guide explained the situation they were excited for her future in the states. After an early evening Macchiato and a nice visit with our guide, we drove out to feed the Hyenas. Yep! We all fed hyenas, with a short stick, right in front of us, and we let them jump on us to eat as well. In Harar, there are holes in the wall to let the Hyenas into the city to sort of "clean up" at night. This is very different than the picture that National Geographic had painted in my head about Hyenas. But every evening, there is a man who goes out and calls the Hyenas into the city, then you sit next to him on the ground (that's right at a Heyena's face level) and you feed them meat. Lielti was once again all in and didn't seem nervous at all. She had a huge smile watching the whole thing unfold. We each took a turn, Leilti wanted Brad to go with her and then I had my turn followed by our guide. It really didn't end up being scary at all, but it sure was stinky! Turns out eating dead animals gives Hyenas a very unpleasant odor! After our full day, we drove and hour back to Dire Daiwa. Lielti fell asleep on my lap within about 5 minutes and I enjoyed a nice long snuggle with my girl. Followed by the best night sleep we have had so far. We now get to enjoy a relaxing morning exploring Dire Dawa before we fly back to Addis this afternoon. We are so glad we were able to make this trip. We both said this was our favorite day in Ethiopia this trip. We have many more pictures to post with this, but our connection is too slow and we have to get going back to Addis! Although we became Lielti's legal parents a month ago, last night felt like the first night as her practical parents. She went to sleep right away but woke up for a while in the middle of the night (probably had a lot of things going on in her head). We all got up at 6:30 grateful for a surprisingly easy first night. We had an appointment at scheduled at the US Embassy for 9:00. But before that, we had just enough time to help Lielti put together her first Lego set. We figure she better get used to snapping together Legos before we get home! She finished the set and has taken them out several times throughout the day to play with them. The Embassy appointment was pretty straight-forward. They asked us a few quick questions, took my fingerprints, and had us fill out a form. In two days we should receive Lielti's immigration paperwork so that upon arrival in the US she will be a US citizen! After the Embassy appointment we went out to lunch, ice cream, and then souvenir shopping. We returned to the transition home to play with the kids a while longer. Toward the end of the day we found out that our trip to Harar is scheduled for tomorrow morning. Tomorrow at 5:45am (Tuesday 6:45pm PST) we will be flying out to Harar, the town where Lielti grew up. There is a good possibility it will be an emotional day for all of us, but we hope the flight won't be part of that. Lielti is excited to fly tomorrow. This 45 minute flight will hopefully be a good sample of what our 20 hours of flying will be like in a few days. Our entire evening was filled with taking out her braids. We started off with some help from her friend around 6:45, but her friend had to leave at 7:00 for dinner. Lindsey and I proceeded to unwind her braids until 8:45. That would have gone much faster had we known what we were doing when we started. Fortunately Lielti had the iPhone and the movie Frozen to keep her entertained. She just sat patiently while we fumbled our way through what proved to be a much more challenging task than we had anticipated. But now she has cute, fluffy freshly washed hair. Since we will be in Harar tomorrow, we don't know what our WIFI options will be, so we may not get a blog post done. We will try to make up for it Thursday! This trip to Ethiopia had more mixed emotions than the first. Since we weren't taking the boys with us, we were more excited to bring Lielti home than we were to travel to Ethiopia. Don't get me wrong, we were excited to go to Ethiopia to enjoy the people, sights, and some one-on-one time with our daughter. However, it didn't quite seem right leaving the boys behind. We are thankful for our family and friends who are willing to watch the boys during this time. Our trip started off leaving Wenatchee Friday evening to the Smith's house to get a few hours of sleep. My sister graciously shuttled us to the airport at 4:45am and we flew from Seattle to Minneapolis. It was a nice short flight and then a few hour layover there. As you might have seen on Facebook, I tried Chick-fil-A for the first time in the airport... since we don't have any of those in Washington. It was definitely above standard for a fast-food chicken sandwich. Lindsey and probably walked 2 miles around the Minneapolis airport just killing time. We had another short flight from Minneapolis to Washington DC where we had an overnight layover. When we got off the plane in DC and headed for the hotel shuttle we could see heavy snow being blown by 30 mph winds. We waited inside and watched for the Hyatt shuttle. Once we saw it we hustled outside with our luggage and walked 100 yards to where it was parked. It was for a different Hyatt. We waited another five minutes outside until another Hyatt shuttle arrived. It was also for a different Hyatt. After another 20 minutes, the first Hyatt shuttle arrived and we were still out of luck. Finally after waiting for 30 minutes in what felt like 8 degree wind chill conditions, the right shuttle arrived. They took our numb, frozen selves to the hotel. After we were settled we ran across the gusty parking lot to the Sheridan where they had a restaurant. I think that was the first Valentines Day we've ever gone out to dinner or went to a hotel. Too bad I can't say I planned this, but an indifference to Valentines Day was in our prenuptial agreement. Again, we got up early to make it to the Washington airport. Besides my carry on suitcase getting stuck in the security scanner for 10 minutes, everything was uneventful. The flight from Washington DC to Addis Ababa was less than half full, so there was plenty of room to feel comfortable - a nice surprise for the 12.5 hour flight. After we arrived we headed to the guest house where we were able to unpack and refresh quickly and then went to the transition home where Lielti was. As we pulled through the gate, Lielti's face lit up and she was bouncing so much that she looked like she would explode. A nanny was holder her to keep her from getting in the way of the bus, but this was futile. Lielti was determined. With a bity of fierceness, she broke free of the nanny's arms and ran to us. She had already cleared out all her stuff from her room and was excited to go with us. After a little confusion, it was determined that we could take her with us today for good. Lielti and us had already planned on that, so the confusion troubled us all at first, but worked itself out later. We took her to lunch and dinner where she ordered traditional Ethiopian food rather than pizza, spaghetti, burgers, or fries. Even though she was with her boring parents she was able to enjoy the company of her closest friend who is currently being adopted by another family. They had a nice time together and are looking forward to more fun days this week. Lielti has been quiet with us so far. We are trying to figure out how to best communicate and I imagine we will see her start to open up over the next couple weeks as she starts to figure us out. We have seen bits of her spunky personality that everyone talks about, but I think it probably won't really appear until she is home with her brothers. We miss those boys and we know Lielti does also. There is a chance that there could be more pictures tomorrow to go along with this, but we are tired and headed to bed! Our last day in Addis, had an air of sadness over it that was unspoken but we all carried it with us throughout the day. But we had a schedule to keep and the morning held a trip to Entoto mountain, a museum and view point and some shopping for souvenirs. We were picked up at the guesthouse and headed up the windy steep road to Entoto Mountain. On the way we saw women, tiny women carrying huge bundles of sticks. I marveled at their strength that seemed incongruent with their tiny frame. Our guide explained to us that these women, usually widows wake up early and make the long walk up the hill (probably two miles). At the top they gather branches that they bind in about 8 foot long bundles and strap to their backs to carry back into town to sell for firewood. In town they sell it for the equivalent of $2US…$2 I voiced my curiosity about how much the bundles must weigh and wondered out loud if I would even be able to lift it. Our guide asked me if I wanted to give it a try. I didn’t want to make light of their work, but he said people had tried it in the past and that they usually are happy to comply if you give them a tip. So I couldn’t pass up the chance…a kind, tiny but strong, lady set her bundle down and helped me secure it to my back. It took about four people to help me stand with it. I was able to take a few steps, but there is NO WAY I could have hauled it down the hill. I will forever be amazed at the strength of those women. Next was a tour of a small museum and visiting the grounds of a church at the top of the mountain. Our guide was very knowledgeable about the history of Ethiopia and we learned a lot! As we left the museum and walked toward the church there was a crowd of people gathered listening to a bishop recite some sort of liturgy. Our guide said that sometimes they offer a specific blessing. Today it seemed they were focusing the service around healing. People with all sorts of ailments gathered seeking a blessing for their health. It was difficult to just walk by them as a tourist. Even though we were within arm’s reach I felt a world away from their circumstances. A feeling that hung heavily on me throughout our time in Addis. Next up was souvenir shopping. I am not a big shopper in general and it turns out my lack of enthusiasm carried over to shopping in Ethiopia as well! Our guide was great in finding us places to shop for authentic, quality items and even helped us settle on prices, even though he admittedly didn't enjoy that part of his job. I would have rather just paid the first price a vendor said because it’s simple and non-confrontational, but I guess that’s not the way it works. We got some pottery, a traditional dress for Lielti, a doll that is like the one she has at the transition home a blanket. The boys had some money from grandpa. They soccer jerseys, an instrument, and a chess set. I liked the small local market, but once we got to the city street stores, I was struggling. It was so strange to be just steps away from someone asking for food or money, someone who has no means to provide for themselves while we were buying things we absolutely didn't need. We asked our guide about giving money to people, but it was not encouraged. I will never be able to reconcile that circumstance between my heart and my head, whether it’s in the states or in Ethiopia. Emotions continued to run high as we headed to the transition home for our last visit with Lielti. We drove in and were approached with a stoic face. It was quite a bit different than the happy girl that was jumping up and down as we drove in on the second day. We spent our time with Lielti and the kids as we did on the other days, playing games, drawing, sneaking in a hug and kiss for our girl while we played. At the end of the day, our guide said, “it’s your last day, so it’s really hard to tell you that it’s time to go”. I gave Lielti a necklace and put a matching on myself. The mood shifted even more toward sadness as we all realized what was coming. The boys said good-bye to their new friends at the TH and then it was time for the moment we have been dreading since we started this process. I have not been able to imagine what it might be like because I mostly tried to block out the fact that I would have to tell my daughter goodbye and fly back around the world. We hugged and cried and for the first time I saw her face with tears running down it. The boys gave their sister a hug goodbye and cried and then we gathered our teary selves into the van where we found the other family there crying too. As we waved at kids and drove away we saw Lielti’s friends gathering around her and hugging her, making sure she was okay. We headed back to the guesthouse to pack up our bags and head to the airport for a 23 hour trip home. It was an amazing experience for all of us. Ethiopia won us over. The time at the transition gave me a chance to see my boys at their best, meet the amazing people who care for our kiddos before we even know them, and most importantly a chance to meet our daughter. We are so in love and can’t wait to go back and bring her home forever! Tomorrow is our last day here and the week has gone by all too quickly. It's going to be hard to leave our daughter here, even if only for 4 weeks. Our morning started off by hitting up the coffee shop on our way to visit the kids. Lindsey was shocked to see me drinking coffee for a second day in a row. I wouldn't say I like it, but the coffee in Ethiopia is much more drinkable than any US coffee. Wesley even helped finish off my macchiato. They were taken to a playground with a small field where we played soccer with the kids. Running around for an hour is really a lot more difficult at 7,000 feet above sea level... or maybe I'm just out of shape. Check out the guns on our girl! After the playground we were able to take Lielti out to lunch with us. She wanted spaghetti, because that is one of her favorites, but she ate so much bread before the meal that she didn't each much of it. It felt so good to be out and about with our whole family. She also swiped several toothpicks on the way out of he restaurant, but I couldn't bring myself to tell her no... this won't be a lasting trend. We finally returned to the transition house and played with the kids for a few hours. As always, every one of the kids were amazing. The little boys have crazy amounts of energy, the older boys seemed very responsible, and the girls... well the girls stole this guys heart. I want to bring them all home. It's just been a few days, but Lielti and the boys are acting like they've always been siblings. They are teasing each other, chasing, and tickling. Spencer even got defensive of his sister when she got into a spat with another kid. We had no doubt that God would put together the right family and he certainly hasn't disappointed. We can't wait to be able to bring Lielti home so our family and friends can meet her. Once again, we all woke up around 5:00 and couldn’t get back to sleep. We prepared ourselves for a busy day and headed out at 8:30 we drove through town through some very interesting scenery to get to the Ethiopian Courthouse. We waited with several other families in a small courtroom style waiting room until we were called back to meet the judge. He asked us a few quick questions and within 10 minutes we were Lielti’s parents! After the court hearing we went to Robera Coffee, did the tour, and sampled their coffee. Yes, even I drank a cup of Ethiopian coffee. It was for the experience. Of course Lindsey loved it and thought it was all great. After that we headed to lunch before going to the transition house to spend the afternoon with Lielti and all the other kids who seem to think we are human jungle gyms. These kids are so fun and amazing. It's good know many of them have families or else we would be trying to adopt them all. There are a few whose paperwork hasn't come through, and others who are older or have special needs. These kids break our hearts. They want families so bad. To see the mixed emotions of these kids who have fun with us, but long to see their own families is overwhelming. This wore us out, but at 7:30 we headed out for an Ethiopian dinner with live music and dancing. The food was amazing and both Lindsey and I had to dance with an Ethiopian lady that amounted to shaking of our shoulders and head. The boys sat patiently in their seats half awake, worn out by the crazy that was going on combined with a week of long days. Our heads were a bit in the clouds today as we legally became a family of six. Lindsey and I have the daughter we have wanted, the boys have the sister they have wanted, and Lielti has the family she has wanted. We already have some clues about what challenges may be ahead, but the same challenging traits are going to bring a tremendous amount of joy and energy to our family. Side note: we have said Lielti's name about 4 different ways since we first heard it. We have even heard a few different ways her friends say her name. For now, we are trying to pronounce it like she does, but it will probably get a little Americanized. Leh-el-tee. If you say it fast and a bit staccato without emphasizing any of the syllables, it almost sounds like the way she says it.